This Homemade Chicken Pot Pie is an easy make-ahead meal that can be easily made in bulk and frozen for later! Always a crowd pleaser! This recipe makes 2 pies. Take pie crusts out of package. If you have purchased the ones in the tins take one tin out and thaw on counter. Turn the second tin upside down as it thaws. While that is thawing mix together in a large bowl the shredded chicken, hashbrowns, peas & carrots, onion (optional) and gravy. 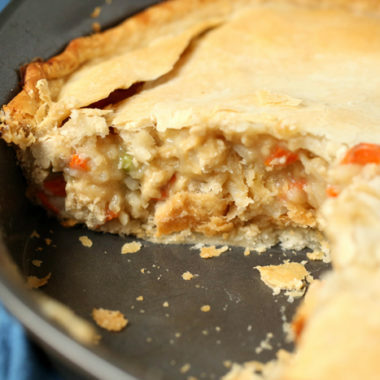 When pie crust has thawed (15 minutes usually) add pot pie ingredients into pie tin with crust. Then take the upside down crust and gently place it on top of the pie carefully. Spread it out and pinch the two pie crusts together on the seams. Poke a few holes with a knife or fork on top of pie. Cover and FREEZE if you want this as a freezer meal, or place in oven at 350 degrees and cook for 35-45 minutes until top is golden brown and you can hear the inside is bubbling. 1.) Thaw in your fridge in the morning and while partially still frozen later that night bake at 350 for an hour or hour and 15 minutes. You'll know when it's done when it's bubbling even through the middle holes. 2.) Thaw completely for 24 hours in your fridge. Then it's bake for 35-45 minutes or till bubbly. or 3.) Place completely frozen in oven and bake until bubbly - could take 1 1/2 hours or longer. My preference is to thaw completely as it always works out quality wise the best, but there have been many days when I am just tired and just pop it in the oven frozen solid too. And it's still good, but sometimes the crust gets more brown before the inside is done (which you will want to watch out for.) If it's getting too brown, cover it with foil for the remainder of cooking time.